Just Jared‘s founder Jared Eng channels his inner Queen of Hearts and celebrates the 2012 Just Jared Halloween Party with his celebrity pals on Saturday (October 27) at Siren Studios Orange in Los Angeles. Celebs who popped by the Alice in Wonderland themed party include Amber Heard, Neil Patrick Harris (with David Burtka), Ashley Benson (with Izak Rappaport), Chord Overstreet, Topher Grace, Lucy Hale, Chris Zylka, Shay Mitchell, Russell Simmons, Colton Haynes, Patrick Schwarzenegger, Keegan Allen, Julian Morris, Tyler Blackburn, Aly Michalka, AJ Michalka, Sarah Hyland, Matt Prokop, Bella Thorne, Debby Ryan, Shawn Pyfrom, William Moseley, Kelsey Chow, Ben Barnes, BJ Novak, Thomas Dekker, Shiloh Fernandez, Shenae Grimes, Matt Lanter, Brittany Snow (with Michael Johnson), Diego Boneta, Holland Roden, Alexis Knapp, Francia Raisa, Cassie Scerbo, Cameron Palatas, Sterling Beaumon, Kat DeLuna, Danielle Panabaker (with boyfriend Ian Durney), Linda Ramone (with JD King), Taylor Spreitler, Chris Galya, Logan Browning (with Bratz costar Skyler Shaye), Mena Suvari, Hana Mae Lee, Cameron Monaghan, Amaury Nolasco, Nicola Peltz, Will Peltz, Britt Robertson, and Ally Maki. We must give high praise and thanks to our wonderful sponsors: WildFox Couture for providing our VIP lounge, Oranum for the spot-on psychic readings, Neuro for our “Drink Me” bars and 3-D glow in the dark tent experience, Discovered inspired by Intel for the video game entertainment, Creative Recreation for the crazy hay maze, Petals LA for the gorgeous flower arrangements and Smokestik. Many thank-yous to the following vendors for providing delicious food and beverage including Popchips, Svedka, Heineken, Skittles, Peligroso Tequila, Leblon Cachaca, Unreal Candy “healthy” chocolate realness, and one of LA’s finest food trucks Flying Pig. Feel free to check out all of the photo booth pics on Just Jared’s Facebook page. Thank you to Get Foxtales for the awesome digital photo booth! FYI: A bunch of our VIP celebs will be sent a package of Wildfox items – a white label sweater, a couture baggy beach jumper, a tee, and a pair of sunglasses. Tomorrow, we’ll be giving one away to one lucky JJ reader. Stay tuned!! 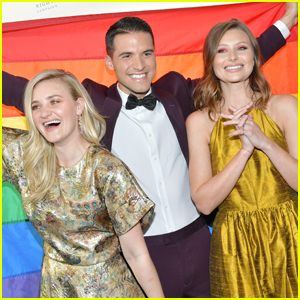 Aly & AJ Michalka Show Their Support at Human Rights Campaign Dinner! Aly & AJ: 'Church' Stream, Download, & Lyrics - Listen Now! January Jones, Jaime King & More Get Festive at By Far Party! 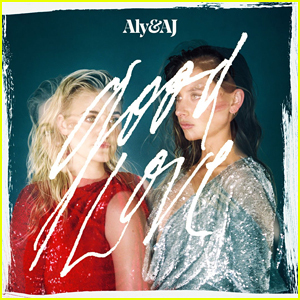 Aly & AJ: 'Good Love' Stream, Lyrics & Download - Listen Here! Aly & AJ: 'Ten Years' EP Stream & Download - Listen Now! Aly & AJ: 'I Know' Stream, Lyrics & Download - Listen Here! 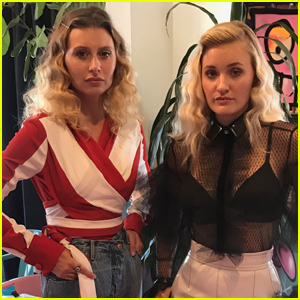 Aly & AJ Debut Vampire-Themed Music Video for 'Take Me' - Watch Now! Aly & AJ: 'Take Me' Stream, Download & Lyrics - Listen Here!